Kosse Homecoming Street Dance - ​Welcome to Kosse, Texas! - A Little Town with a Big Heart The official web site of the Greater Kosse Chamber of Commerce. Kosse is located in Limestone County, Texas. ​The highlight of Kosse Homecoming Weekend is the Street Dance in downtown Kosse. 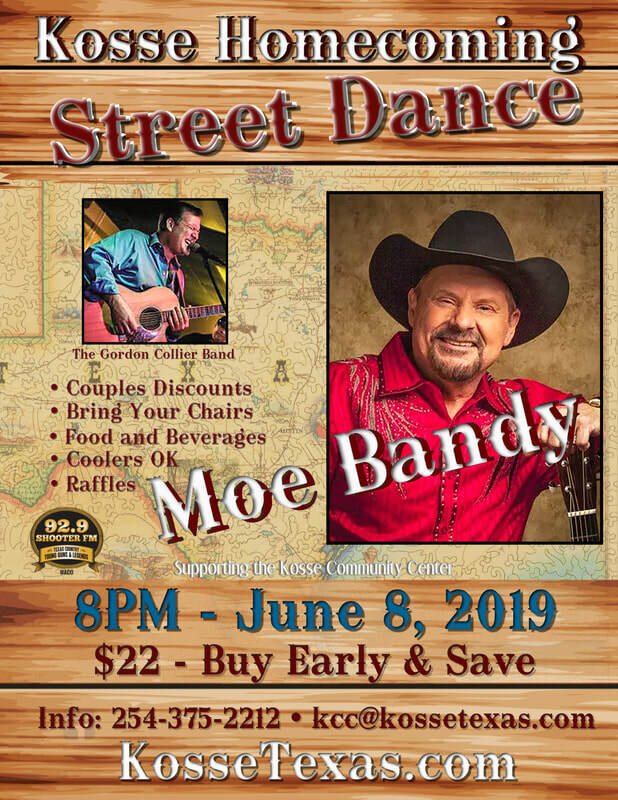 This year features country music legend MOE BANDY! Central Texas favorite, The Gordon Collier Band, will open the fun at 8:00PM. Bring your chairs... coolers are welcome. Enjoy, BBQ, sausages, fajitas, stuffed potatoes, shaved ice, soft-serve ice cream and a full array of soft drinks, beer and wine. ​ Kosse City Hall or Online!